Mexican Bush Sage | Decorative, Fragrant and the Hummingbirds Friend! Mexican bush sage (Salvia leucanthais), also called woolly sage, is a popular herb but unlike, its mainstream cousins, this variety is for decorative, ornamental purposes only. Native to central Mexico, it has needle-like green and furry leaves and flowers that range in colour from deep purple to lavender. Mexican bush sage is a popular choice today in gardens as the plants last for a long time whilst retaining their pretty flowers. But whilst other varieties are used frequently in your home cooking and are a critical part of Thanksgiving turkey stuffing, this variety is not for eating. Instead, it is strictly used in the garden for its graceful beauty and its delicate aroma. If you have a garden with a sunny corner, the Mexican bush variety makes an easy and beautiful choice to round out your plants. It also provides you with lovely and long-lasting cuttings to freshen up your home all summer long. Easy to grow, it requires little maintenance with blooms in late summer that last for several months. Typically, it grows to about three feet all around, and are also a big choice for wild life, as they attract hummingbirds and butterflies to your garden. The stalks also dry well, and are a common choice in dried flower arrangements as they last so long. See my growing page for detailed tips and advice on cultivating other types. Note: There is another variety called Mexican sage, which is a different plant altogether. Click here to read more about this type. Jerusalem Sage - Very Pretty and Tasty! 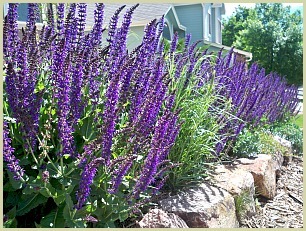 Meadow Sage - A Magnet For Hummingbirds!